I am starting the holiday baking season in epic fashion – with these ultra gooey chocolate chip marshmallow cookies! The radio has been playing Christmas music already for weeks, and holiday displays magically appeared in shopping malls pretty much the day after Halloween, but it still never feels like Christmas to me until after Thanksgiving. Technically, I believe the Christmas season shouldn’t start until December… but when it comes to Christmas cookies, I am impatient and always start a little early. 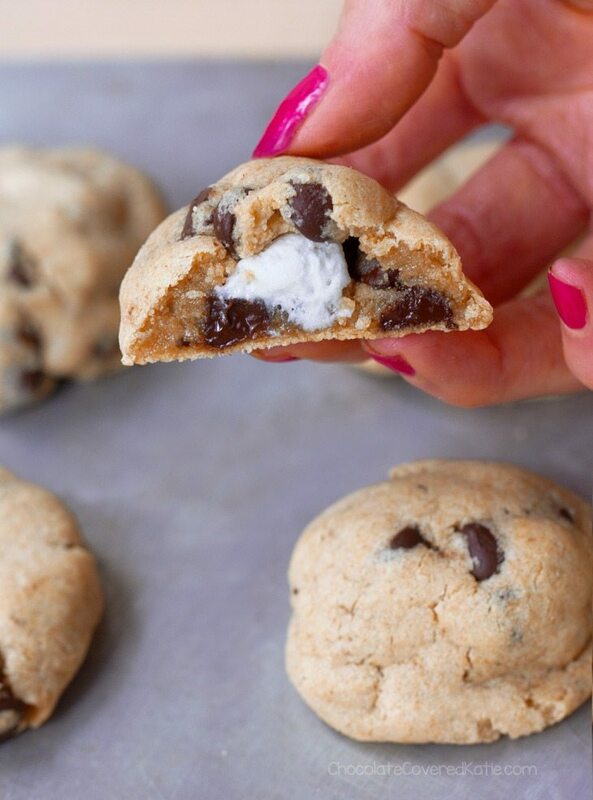 These are homemade chocolate chip cookies with a twist: Stuff mini marshmallows inside each cookie—I recommend vegan marshmallows because they stay fluffy when baked—and suddenly you have transformed the ordinary into the extraordinary. So imagine their surprise when they take a bite and discover a surprise marshmallow creme filling hidden inside! Step One: Make up a batch of cookie dough, then roll into balls and press two mini marshmallows inside of each ball. I used vegan mini marshmallows here, which retained their shape beautifully while baking and yielded a visible marshmallow creme center. Step Two: Refrigerate the cookie dough balls if you want soft chocolate chip cookies, or bake right away if you don’t. The marshmallow cookies will look underdone when you take them out of the oven, so let them cool for 10 minutes, during which time they will firm up. Step Three: Bite into a cookie to reveal the hidden marshmallow creme center. Store leftovers in a covered container. 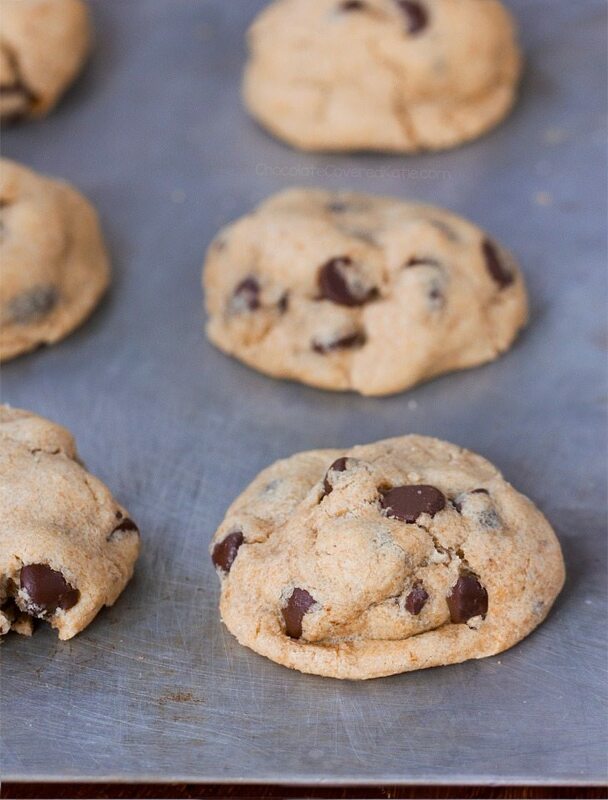 And if you want to make up a bigger batch of dough, you can make up the dough ahead of time and store extra cookie dough balls in the freezer to thaw and bake any time a hot-from-the-oven chocolate chip cookie craving hits. 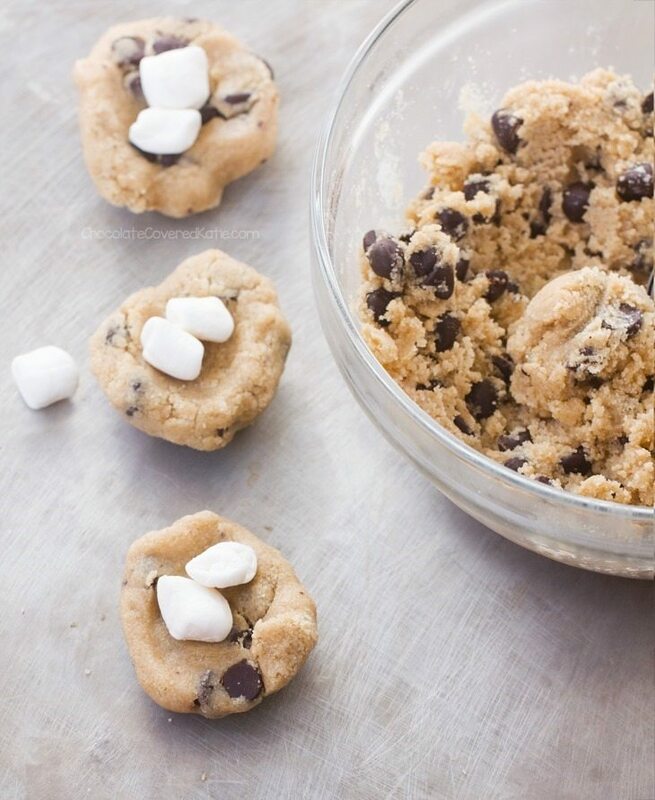 Combine all dry ingredients (except marshmallows) in a medium mixing bowl, then stir in wet to form a dough – it will be dry at first, so keep stirring until a cookie-dough texture is achieved. (Only if needed, add 1 tbsp extra milk of choice – I didn’t need it.) 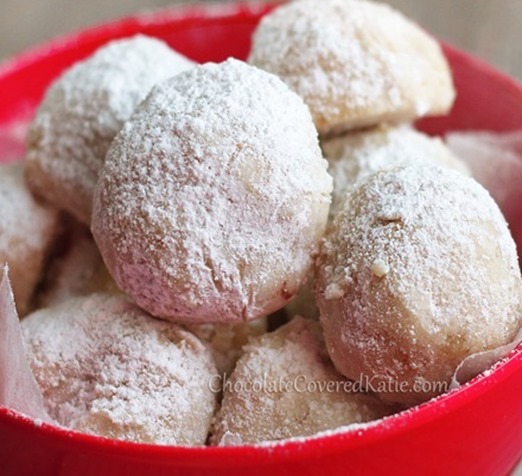 Roll into balls, then smush two mini marshmallows into each cookie and re-roll into a ball. (If dough is too soft to roll, you can refrigerate before rolling.) For soft cookies, refrigerate or freeze until cookie dough balls are chilled. Preheat oven to 325 F. Place cookie balls on a greased baking tray and bake 11 minutes on the center rack. They’ll look underdone when you take them out. Let them cool 10 minutes, during which time they will firm up. You can also choose to make extra cookie dough balls and freeze them to bake at a later date. Previous Post: « How To Cook Sweet Potatoes – The Three Secret Tricks! Katie, how did you know I was just started to experiment with healthy, sugar-free marshmallows over Thanksgiving break??? You have given me something to smile BIG about! Thank you! This is like an early Christmas gift! Question: do you think I could use your healthy marshmallow fluff instead of mini marshmallows? I’m thinking of adding a a firming agent (such as a gelatin-like-something) to help hem retain their shape longer. What do you think? Do you think it would work without that, anyway? You never know unless you experiment, but it sounds like a fun experiment to try. Be sure to report back if you do try! I love how these cookies look like regular chocolate chip cookies, but there is marshmallow hiding inside! Do you (or anyone) know why vegan marshmallows retain their shape? I did not know that and it’s super interesting! And yay for holiday baking! I believe (after a quick internet search) that the melting point of agar is much higher than the melting point of gelatin – the thickeners used in vegan and non marshmallows, respectively. Related interesting tidbit: agar sets at a lower temperature than it melts! Yay science! 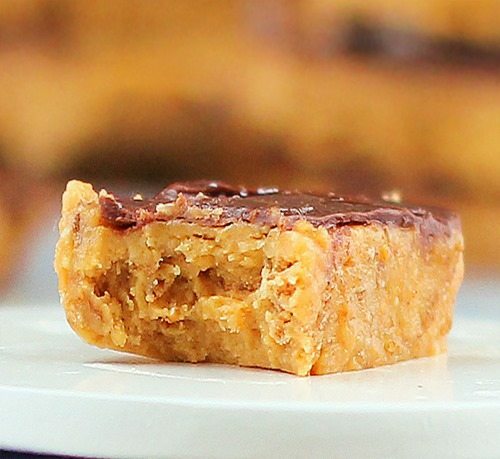 I just made these with oat flour and it was a total flop…literally. They are flattened out and the marshmallows melted all over. Definitely not like your photos suggest! Did you use vegan marshmallows or regular ones? Probably the nonvegan ones I’m guessing. I made them with oat flour (and vegan marshmallows) and they were awesome! I also made a batch with white flour. I know, not the healthiest but I don’t know where to get spelt flour and don’t live near a whole foods. Hi…where do you find the marshmallows that are vegan?? Thank you for giving us so many healthy dessert recipes. My husband loves your banana bread….he said it is the best he has ever had and that it is ridiculously moist……which is a huge rave from him. He comes from family bakers but the banana bread is the best by far. Also, how long will the cookies stay fresh tastinf in the freezer? Yes, I’d also like to know where to buy vegan marshmallows! I find mine at Whole Foods or Fresh Thyme and even Meijer. They are the Dandies Brand and I love them! You can find them online at places like vitacost.com if you don’t live near a Whole Foods or health food store that would have them. Trader Joes’s also has them. 1/2 cup of sugar in a dozen cookies? And that doesn’t count the sugar in the chocolate chips and marshmallows. They look delicious, granted, but healthy they’re not…. Yes, the recipe link that you found online does indeed use 1/4 c. more sugar. 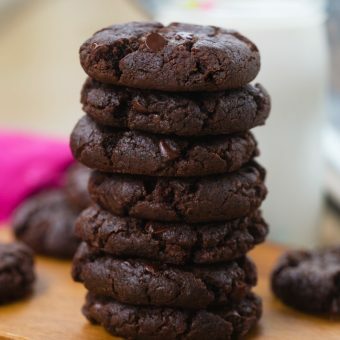 A quick perusal through my traditional recipes (passed to me from my mother) confirms my initial thought–1 to 1 1/2 c. sugar per recipe, which typically makes 3 dozen cookies….which equals 1/2 c. per dozen cookies. 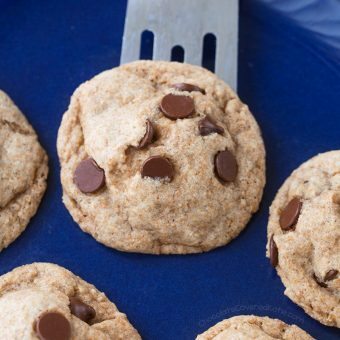 But you can easily lower the sugar amount on most cookie recipes by 25% without many people noticing. We all need to do the math on any recipe–baker beware! While less sugar is better, it is still sugar. Sure, a 3 scoop ice cream sundae is “healthier” than a 5 scoop sundae, but few people would tout it as healthy! 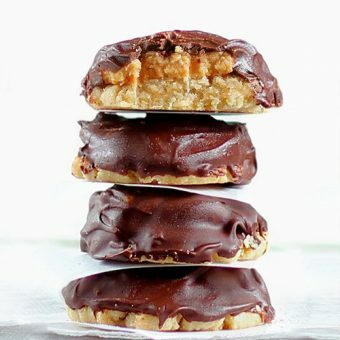 My larger point is that I’m sorry to see an increase in sugar-based recipes on this blog instead of the outstanding, earlier recipes that utilized more creative non-sugar options, like dates. 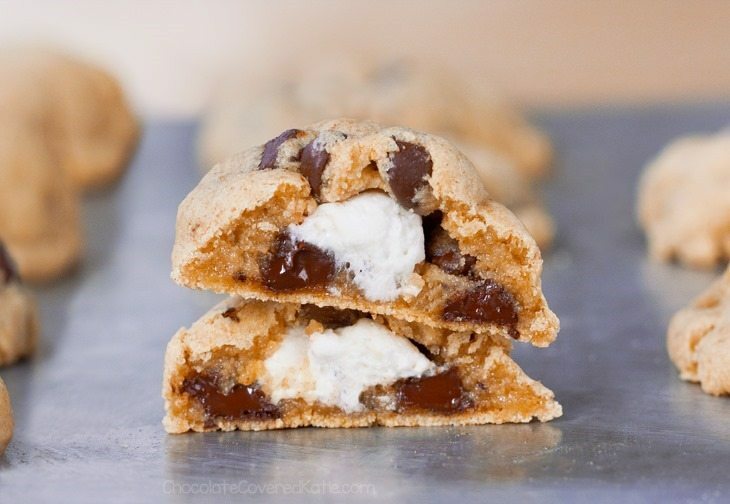 WOW Katie, it’s like chocolate chip cookies and s’mores all at once. Freaking awesome. Your recipe is killing me. At first I was like “marshmallow ? but I’m veggie I can’t eat marshmallows” and then boom vegan marshmallows ! Cookies sent from heaven ! Another awesome CCK recipe. I want to eat them all and not share. I think I will make two batches next time. Question: it using oat flour, is there no need to add xanthan gum since it’s gluten free? (I was going to make some oat flour by grinding down my gluten free oats but was scared to since nothing about adding xanthan gum and a previous commenter’s try with oat flour was a bust). I used oat flour and didn’t use xantham gum and they still held up wonderfully. Oh. My. Goodness. These look amazing!!! I rarely make recipes I find online (only because I spend so much time making my own) but I WILL make these!!! I usually use a 1:1 ratio of rice and oat flour for my gluten-free baked good recipes. Would just oat flour hold up?? I made them with just oat flour and they held up wonderfully. I had just bought vegan mini marshmallows at Trader Joe’s so perfect timing! They turned out great! I had to use more liquid though. Same with Heidi M here. I had to use about twice more of milk as what the recipe says, in order to form proper consistency of the dough. I just made them with Whole Wheat Flour and they won’t roll. I love all your recipes and this one looked amazing. Is there any way to save the ingredients? Should I add more of something to help them roll or bind together? Unfortunately, whole wheat flour isn’t listed as an option, so Katie really would have no way of knowing the results of substituting it in the recipe. Stephanie, as Julie Dove commented, only spelt, oat, and white flours are are listed in the recipe. It’s not quite Katie’s responsibility to solve your issue if you made a substitution that wasn’t recommended. I made these last night for a party I went to. I don’t mind at all not following recipes to a tee. So I used my own gf flour blend and did everything else as the recipe says except I had to add more milk to get them to bind together. Those cookies turned out really great except that I used unrefined coconut oil and the cookies did taste slightly coconutty and usually I don’t mind that but it didn’t really taste quite right in these. So I did a little brainstorming and instead of using the oil, I used spectrum’s non-hydrogenated shortening in place of the oil except I used 3T of the shortening instead of 2T. I made them using my gf flour blend and the rest of the ingredients were the same except I did still have to add more milk to help bind it all together. And these are awesome. The cookies with the oil are crumbly. The cookies with the shortening are not crumbly at all and they are so soft and taste great even this morning as I had one for breakfast. With all that being said, I probably should have added xanthum gum at least to my first batch. Probably would have helped them stay together better. Great recipe. Thanks Katie! Just be aware: this recipe makes really sweet cookies. I’m sure many people would enjoy the sweetness, but I found this recipe too sweet for my taste. For my second batch, I used only about 60% of the sugar & 70% of chocolate chips recommended by this recipe, and the cookies were simply perfect. It was a good idea to freeze the marshmallows but be careful when removing the hot cookies from the sheet. Hot marshmallow can really burn the skin! They didn’t look like the pictures but they still came out delish! I had to add an extra tablespoon and a half of non-dairy milk to make the dough stick together, which is maybe why they spread so much? They were (past tense, they’re all gone!) very soft, moist and chewy and the marshmallow came through the top in a few of them, making a kind of cool swirly pattern. I stacked the leftovers in an air tight container and the next day they had fused into one giant mega-cookie. I was not mad at all. 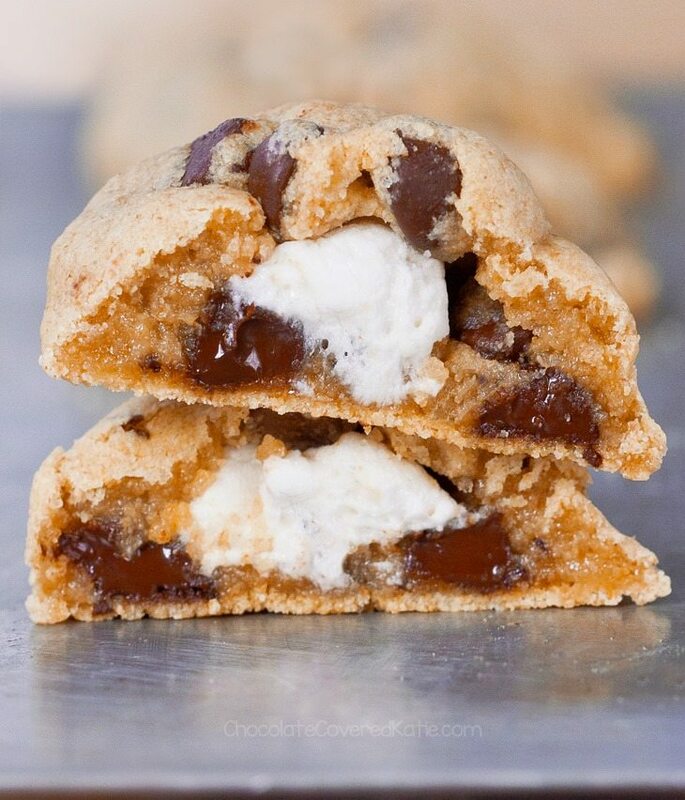 If marshmallow cookie stacks aren’t already a thing, they totally should be.